Dried fruitcake? No, dried fruit… cake. I don’t typically like fruitcake. I like dried fruit, though! Actually, one of the two cakes that I made this weekend is going out to my friend and co-worker, Gilad, who donated a significant sum of money to the PTC Movember team in support of men’s health programs, in exchange for one surprise dessert a month, selected & baked by yours truly, from The Baking Bible. I chose this one for Gilad this month, because I happen to know he has a taste for cranberries, apricots, and apples, and isn’t a big fan of things that are super-sweet or covered in frosting, so this seemed like a good choice. This cake wasn’t difficult, but I found the prep work rather time consuming. Toast the pecans. Check. Crunch them up into 1/4″ pieces. Check. Chop up your dried fruit. Check. Zest your orange(s). Check. Note the cute little Zest N’est Zester. Check. Weigh out your dry ingredients. Check. Weigh out the butter & sugar. Get lazy and put them all together, rather than melting the butter first. Check. 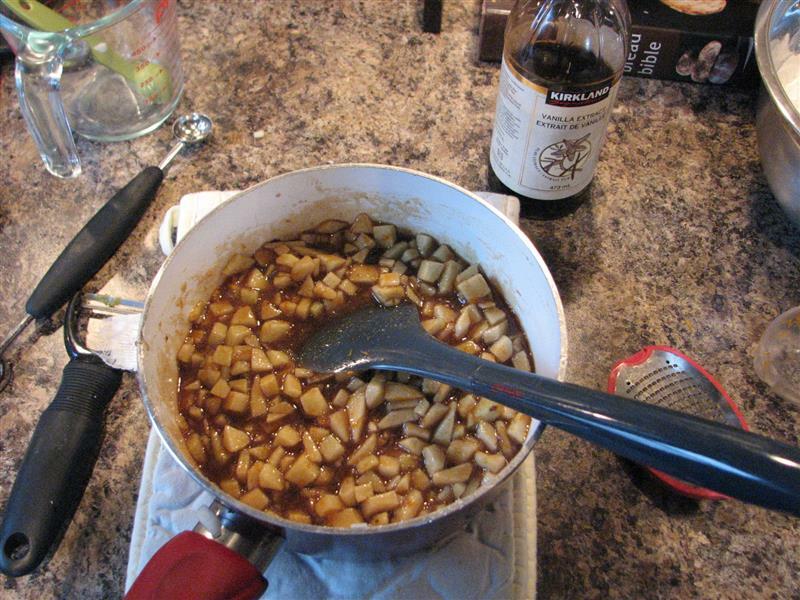 Whoops, you haven’t peeled, cored, and diced (1/4″ pieces again) your apples, yet. Do that while the butter & sugar mixture is on standby on the stove. 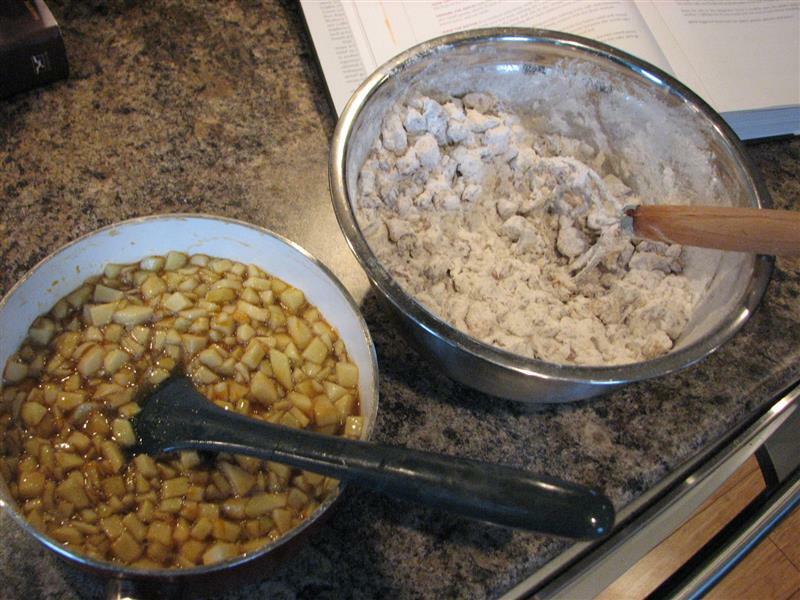 Mix the apples into the sugar/butter mixture, and realize you forgot to take a picture of either one on their own. Oh well. Pour boiling water over the dried fruit, and while you’re waiting 5 minutes, whisk the dry ingredients and add the pecans. For my dried fruit, I used apricots, apples, and cranberries. I think I probably should have picked something other than apples, because I’m not sure I can tell the difference between the dried apples and the fresh ones, but apple-y is good, I think. 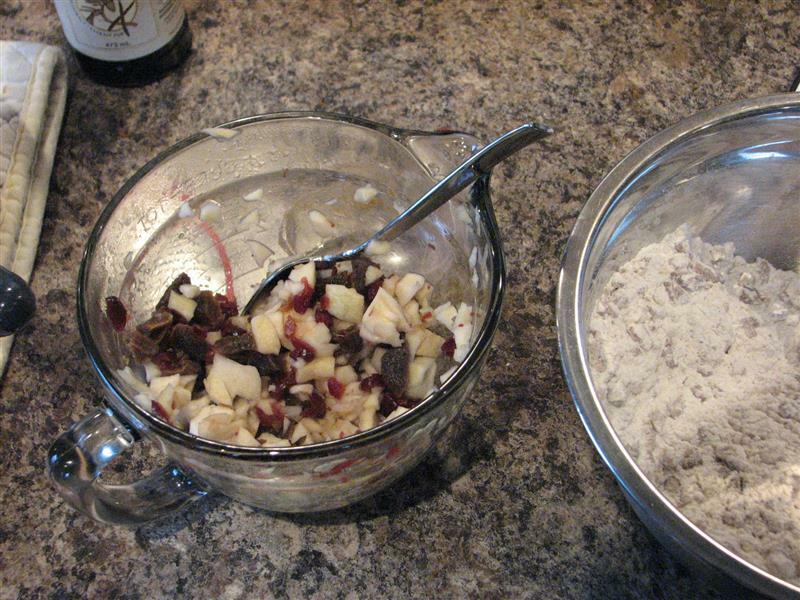 Once the squishy fruit is drained, add it to your flour + pecan mixture, and mix that up. Oh, and somewhere in there, you add the eggs to the wet mixture. Mix wet into dry, then pour it in the pans and bake. See? Not hard, but a lot of prep work. After it’s baked & cooled, you optionally soak it with 1/4 cup of rum. 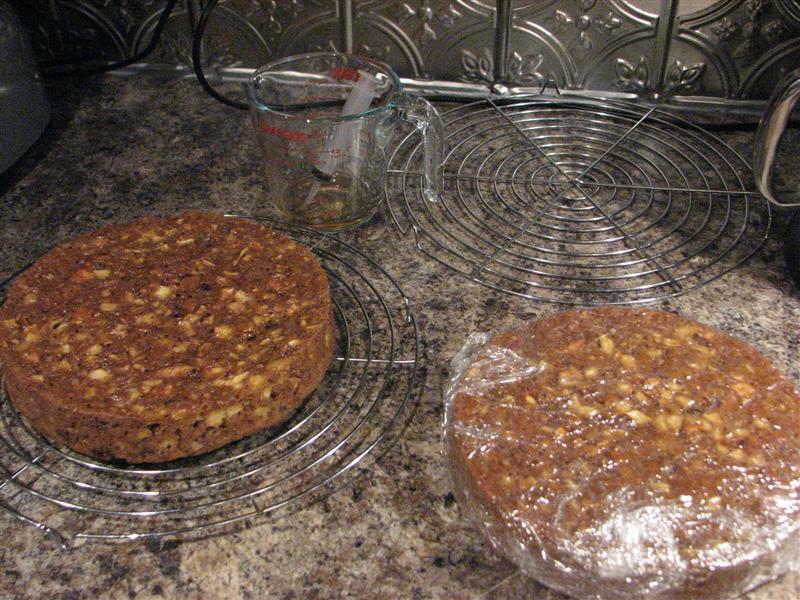 Since I used 9″ round cake pans, I soaked each side with about a tablespoon of rum, then wrapped them up in plastic wrap. I hope Gilad likes it! Posted on December 8, 2014 September 22, 2015 by KristinaPosted in Baking, The Baking BibleTagged dried fruit, fruitcake. The cute little Zest N’est Zester is noted. Check. Cakes look wonderful. Check. Lots of apples–love apples in cake. Check. It seems you had a good time with this. Check! I’m not an alpha baker yet, just on the alternates list. Just the same, I’ll be baking along side of you. Maybe a spot will open up. 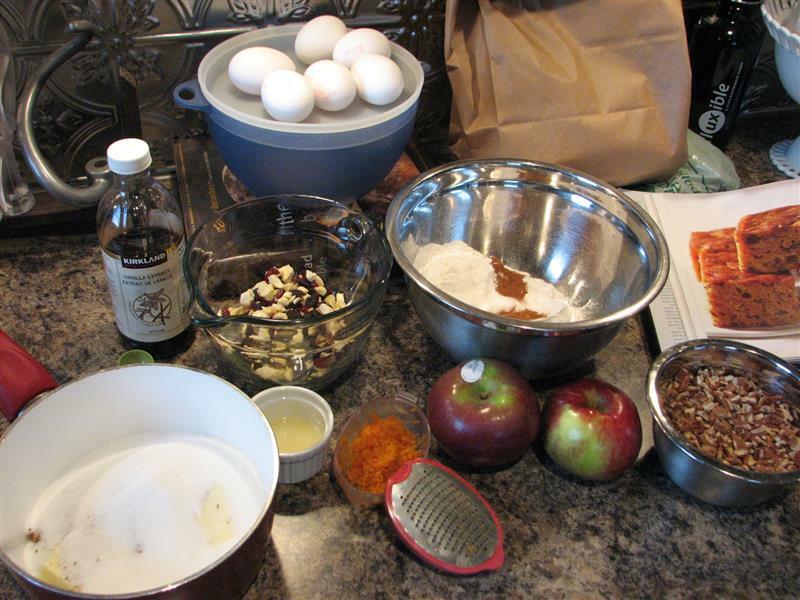 I posted my fruitcake at http://www.thefinercookie.com. I agree, the prep was virtually all of the work in this recipe. Once that was done, the cake went together in no time. Great post! Using dried cranberries is an inspired idea. In fact, I think just cranberries, without the apricots, prunes, apples, pears, etc., would be just right. That’s how I’m going to make it next time. Aha! Like you I dumbed everything in the pan when I was melting the butter – except the eggs and apple. Next time (if this is a repeat) I’m going to add the eggs to the wet batter BEFORE adding the apples.. it will be so much easier to whisk the eggs… your final round cake looks beautiful. I detest zesting so this gadget looks good to me! It was a lot of prep work but perfect for a child to get their hands into. Your generous friend is quite lucky! cranberries! … and so festive looking. Nice pictures, and your step by step write up . I’m one of the new girls in the bake along, stop by . Gorgeous post! I used dried cranberries too and apricots etc. I think the mixture was enhanced by the orange as well – and a lot of rum ; ) Running right out for the zester.